I figured that I should write a companion post to my website favorites post, so here is a list of some of my favorite things. The items listed below are in the order of how often I use them (most often first). 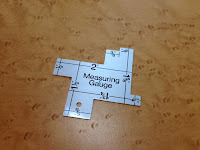 I do use other tools, but these are items at the absolute top of the list of items to keep on hand. I have been able to find these items at my local fabric stores, sewing shops, and on Amazon. The Post-It Roll can sometimes be found at office supply stores, but I usually have the best luck finding it on Amazon. The most important thing to remember is to use what works for you. If you have a different product than what I recommend, that is great. I'd love to hear what works for you. I hope this list will give you some good ideas. When would I use them? Anytime you are pinning fabric. They come in a lot of different sizes (fine, extra fine, smaller head, larger head). What makes them cool? One of the early warnings I got when I started sewing was to spend the little bit of extra money and get these. I know I spend more time than I'd like in front of my ironing board, and I do not want to wind up ruining my fabric because the plastic heads on my pins melted. Glass has a MUCH higher melting point than plastic, so it isn't the stuff of nightmares! 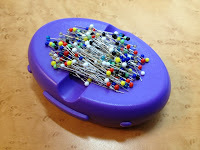 I have gotten rid of all of the plastic ball headed pins that I own because it just isn't worth getting them mixed up to me (I do have some of the flower head ones though). Make sure the package says GLASS HEAD. Not all ball point pins are glass head. 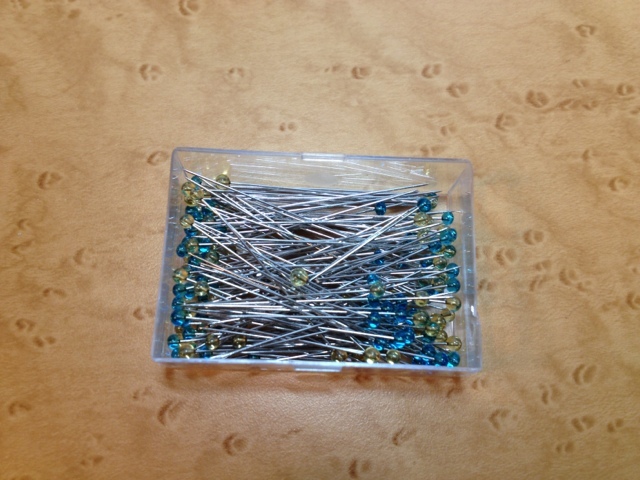 Collins is just one of several companies that makes and sells the glass head pins. What makes them cool? 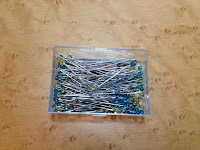 Pins are easy to pick up and the magnet will grab any pins that you put down within a few inches of the caddy. I prefer ones with a lid because I do transport them to and from classes, so just pay attention to the packaging. It has been my experience that pins lay pretty flat on them, so I don't often become a human pincushion. 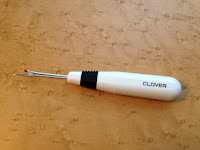 The bad thing is that they won't work with pins that aren't magnet friendly and some of the less expensive models use plastics that will break if dropped (that is what led me to buy the Clover one). Much to my dismay, I know the 2nd part of that from firsthand experience. The one I have now has had several falls and has remained intact. If you put a ton of pins on the magnetic pincushion, they can't all lay flat which can greatly increase the amount of stab wounds you encounter. When would I use this? If you are reading this, I am going to assume you probably sew. If you sew, you will have to rip out stitches at some point in time. What makes them cool? The curved, ergonomic design is much easier to hold. It has a larger handle than the ones that come with your sewing machine. 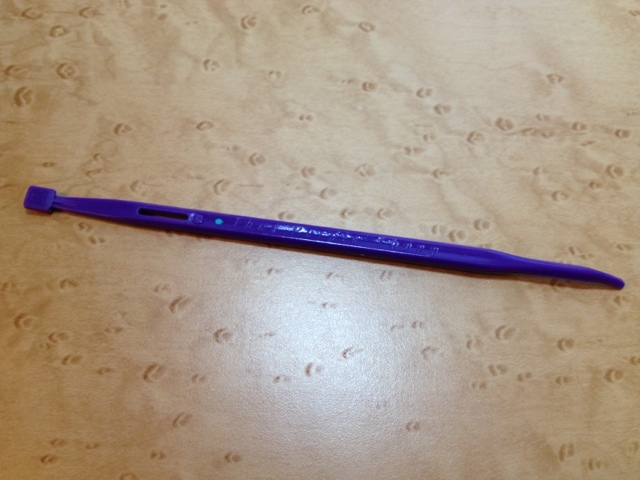 It feels more like a marker than a skinny pencil or a popsicle stick. 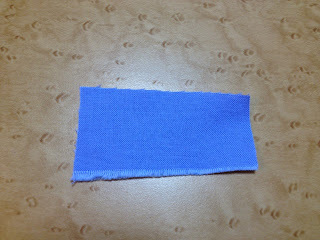 The point is pretty fine for ripping out small stitches. They also seem to be pretty durable. When would I use this? 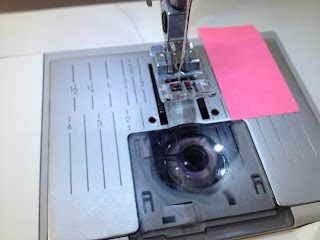 You can use this to turn points, push out corners, feed ribbon through a casing, pull up bobbin threads and a LOT more. What makes them so cool? I am not a fan of its name, but this is one of my absolute favorite notions. 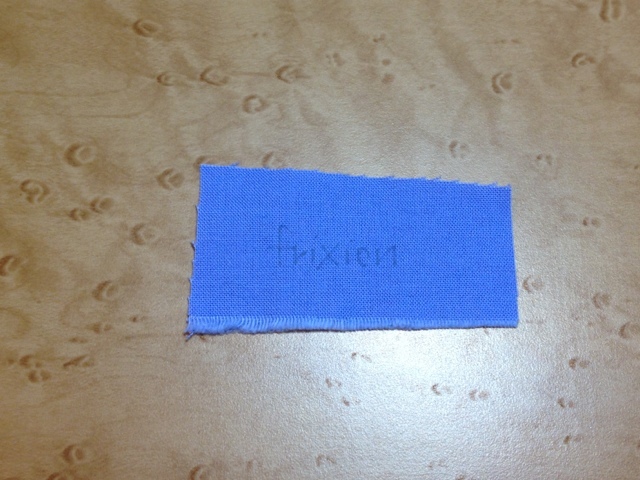 I keep one in my box of stuff that I take to classes and one by my sewing machine. I always want to keep one near. I heard about one in a class in September 2012, and I have found myself reaching for it more and more frequently. I've only seen them sold individually, but Nancy's Notions has a 3 pack! When would I use this? I use them all the time. They are great for cutting thread. 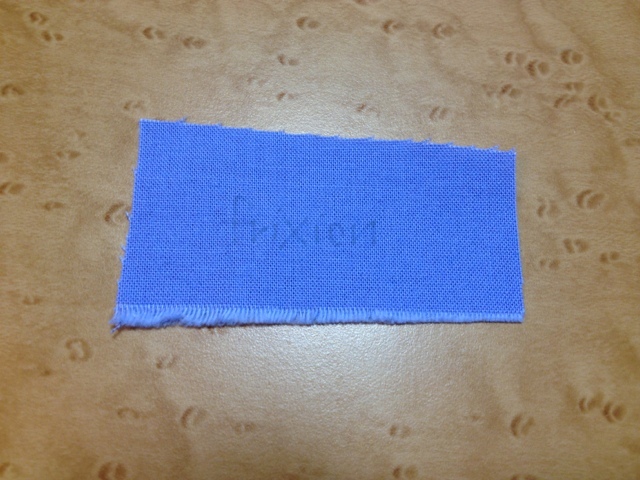 I trim up embroideries, clip thread tails, and use them to cut the thread so that I can properly un-thread my machine (Do NOT just pull the thread back out from the top. Clip the thread close to the spool and pull it through the machine through the typical thread path). What makes them cool? They are super sharp and reasonably priced for the cutting power that they have. I also love the variety of models. I have a double curved blunt edge pair that makes cutting hooped fabric a piece of cake, in addition to my curved point pair (for extra close precision in cutting) and regular ones. 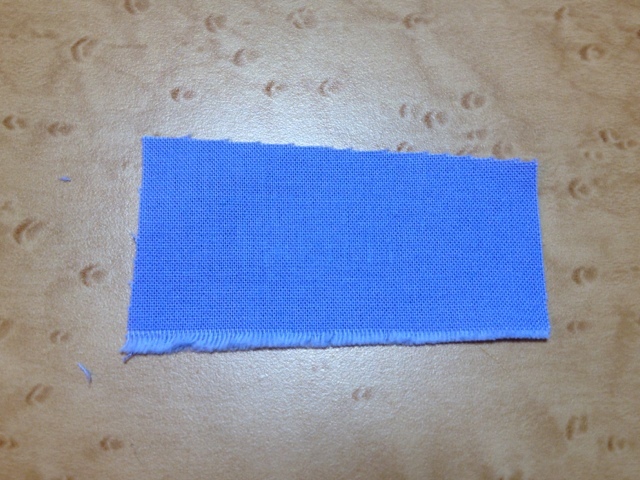 The blunt edge option is great if you don't need to clip super close to the fabric or if you tend to pierce the fabric with the point of your scissors. The picture shows straight, curved, and double curved blunt point models. When would I use this? When you cut stuff. :) I have 2 pairs. One is exclusively for paper and one pair is exclusively for fabric. What makes them cool? I love the hard plastic cover that the blade slips into. After cutting out my first clothing pattern, I had blisters from the large plastic handles on my scissors. In truth, I do hold my scissors strangely. 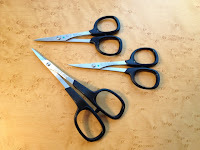 I spent the first few decades of my life as a left handed person using right handed scissors. While I am re-learning how to use scissors, I changed to an all metal pair of shears that did not have a large, molded grip. For me, they are much more comfortable. Mine are the left handed version with the reversed blades, but the right handed ones are much more common. I know my mother loves her "normal" (aka not left handed) Gingher scissors. 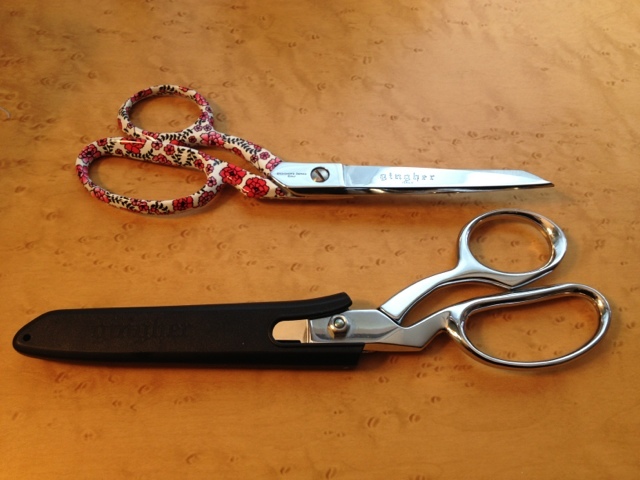 Remember, your sewing scissors should NOT be used for cutting other things. Scissors designated for cutting fabric should only cut fabric. When would I use this? Need a label? This stuff is basically a long, skinny all adhesive backed Post-It Note. I learned about this from a sewing teacher. 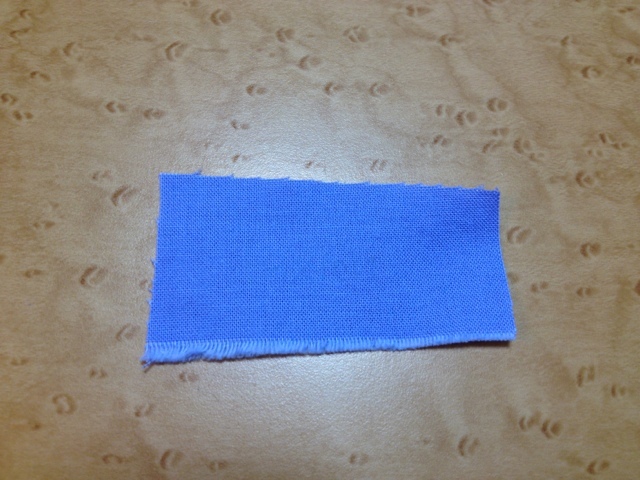 She recommended it to mark the seam on your machine's needle plate. What makes it cool? Painters tape is a pretty common thing to use to mark seams on the needle plate, but I have seen painters tape leave icky residue. Post-It tape is very easy to write on and it comes in a lot of different colors (I've seen it in pink, green, white, and yellow). It is also easy to remove and reposition. 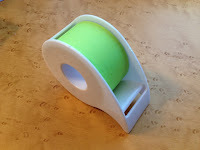 One of the other neat things is that it comes on a dispenser roll (like tape). When would I use this? 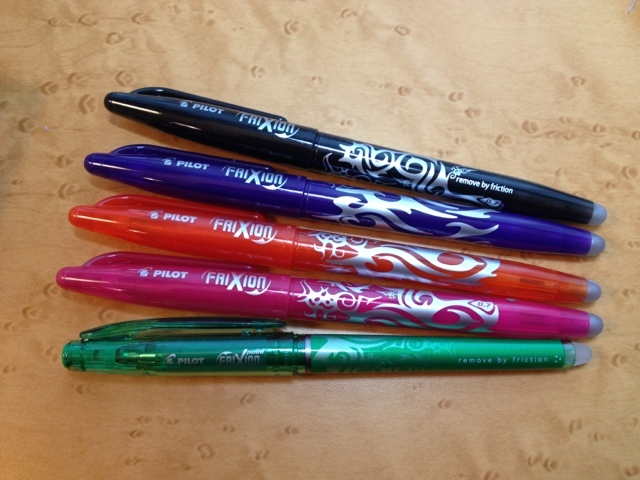 These are ink pens, so you can mark a much more fine line. 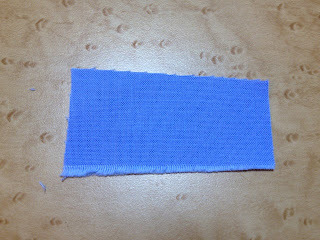 You can use this for marking fabrics with a pretty tight weave/knit. They come in a wide variety of colors (I have black, pink, green, orange, and purple). These inks disappear with friction or heat. Just to warn you, the inks will reappear if the items are frozen, so don't put your stuff in the freezer. I decided to test this out, so please see the pics below to see the results! 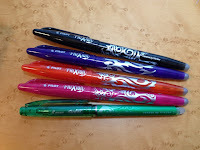 I used these when I made a pair of pants (the pink was great on my khaki fabric), on some samples that I made in a class to demonstrate some different sewing/finishing techniques, and I've even used them for taking notes as a regular pen. I don't think they are a replacement for chalk or wash out markers, but they would make a great addition to your toolbox. As with anything, please test them with your fabric before marking up a whole garment to ensure that you have the desired results. When would I use this? It is a quick way to keep yourself on track by checking your seam size. When would I use this? I use this in placemats, in covers for decorative pillows, and in quilts. What makes this cool? It is medium weight and medium warmth. I am allergic to wool, so I avoid any batting that is wool or has wool in it. 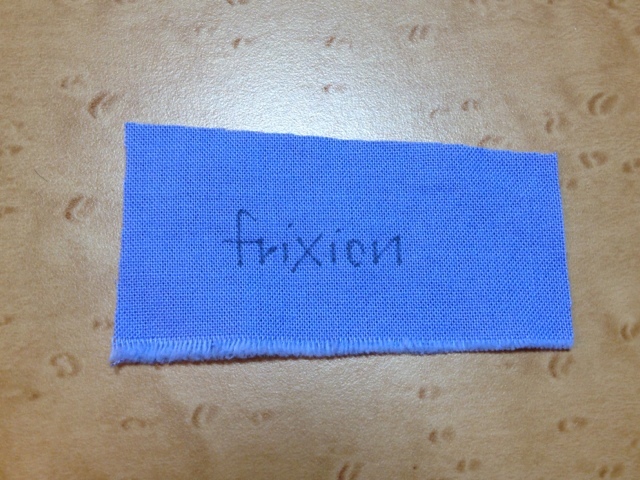 The cotton is very soft and smooth. I have never had a problem with a sewing machine punching through this (even an inexpensive machine not just a high end one). It is also lightweight and not very bulky. While it is available in different lofts, I have only used the Select version - the midloft. 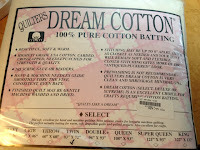 I have had good experience with washing items containing Dream Cotton. 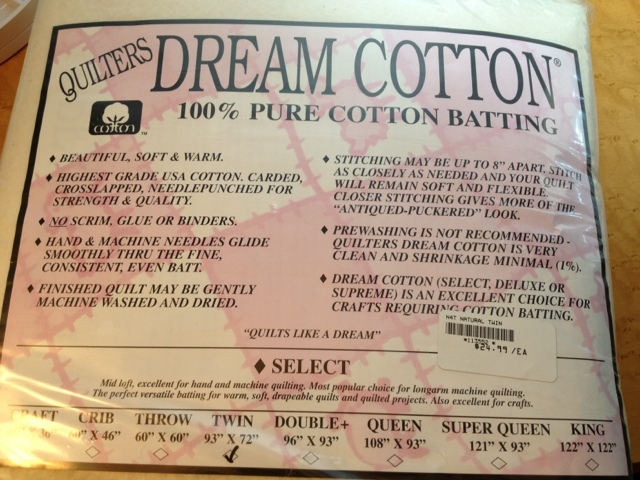 You can quilt up to 8" apart with this batting.